Enjoy the theme park of your dreams without ever leaving home! Active Life: Magical Carnival lets players explore an array of intriguing themed carnival attractions including haunted houses, a lively circus tent, a pirate ship on the high-seas, a colorful parade and exciting fantasy zone. A veritable thrill-ride of activities will keep the whole family moving as they tame lions, steer pirate ships, explore haunted houses, ride a flying carpet and much more. 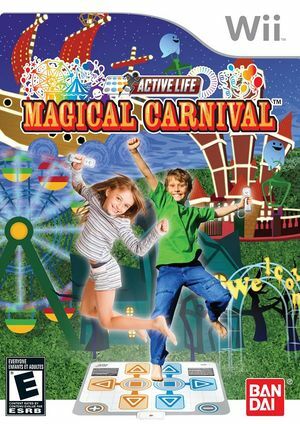 Active Life: Magical Carnival includes over 20 action-packed attractions with support for up to 10 players in fun cooperative or competitive challenges with multiple difficulty options to cater to all skill levels. Party at the Park mode lets up to 10 players play in a series of individual or team-based activities that gives everyone a chance to get in on the action. One to four players can play through a Dream Attraction mode filled with dozens of themed carnival attractions including a: Circus, Parade, Horror, Pirate and Fantasy attractions. A versatile Free Play mode offers easy access to individual attractions. Finally, invite a friend to the carnival in the two-player Let’s Go Out mode. Send an invite to a Mii on your Mii Plaza to spend some quality time with that special someone. This game is known as Family Trainer: Magical Carnival in Europe, and Issho ni Asobu! Dream Theme Park in Japan. This title won't move past the loading screen. "READ ERROR" with D3D and OpenGL, with or without dual core. The graph below charts the compatibility with Active Life: Magical Carnival since Dolphin's 2.0 release, listing revisions only where a compatibility change occurred. This page was last edited on 1 August 2018, at 12:04.